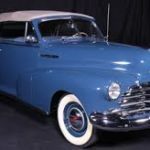 The 1947 Chevrolet Fleetmaster Convertible set an all-time record for convertible production in a single year with 28,443 units produced. At a time when most auto companies were still retooling after WWII, the design of the 1947 Chevrolets varied little from the 1946 models. Despite a slight change in the grille of the 1947 models, it is mechanically identical to the previous year. This particular car was built in St. Louis, MO. Many of the components (fenders, hood, grille, and engine) were built in Flint. Ronald A. Sovis (September 24, 1958 - November 15, 1973) purchased the car from its second owner in the fall of 1972. At that time it had the original top, seat covers, interior side trim, and was a non-authentic red color. Upon Sovis's accidental death, the car was put in storage. 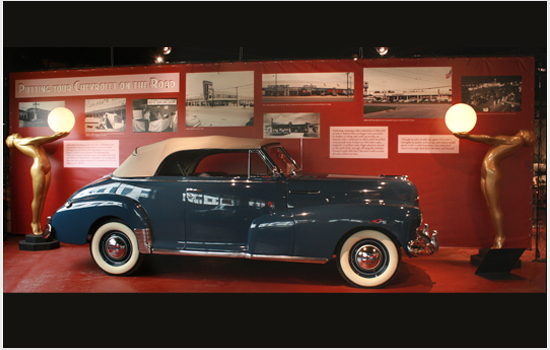 In the fall of 1998, Ronald's father, Robert (Bob) Sovis, completed the restoration of the vehicle. 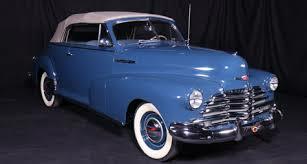 It was painted "Freedom Blue," an authentic 1947 Chevrolet color chosen by Ronald before his death. This vehicle was donated by his family in his memory.